This section covers the line south of the station, in the West Bridge and Braunstone Gate area. Parts of the track bed of the Great Central Railway can be walked in the south of this area since it is now used by the Great Central Way foot and cycle path, south out of the city. The River Soar and the Grand Union Canal feature prominently in this area. 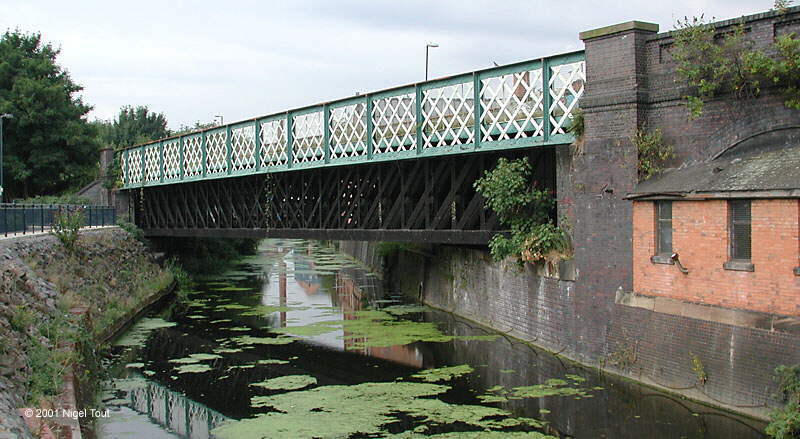 The River Soar splits into two between Upperton Road, at the south of the Great Central goods yard, to West Bridge. 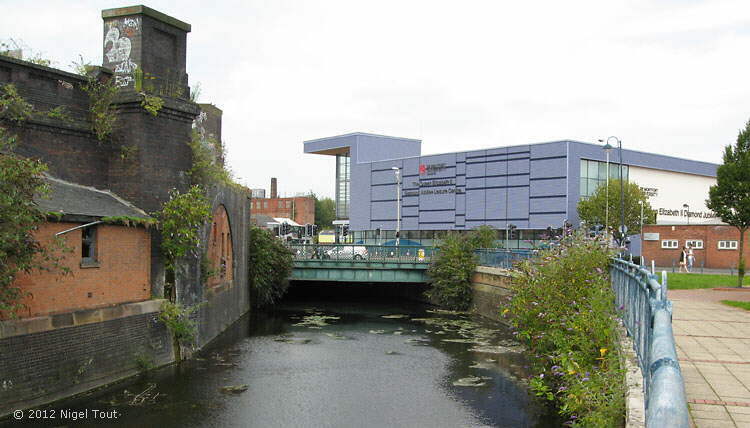 The canalised River Soar is the east arm and flows along to the east of the goods yard site, across Western Boulevard. It was straightened out as a flood prevention scheme just before the Great Central was built at the end of the 19th century, and was crossed by the Great Central at West Bridge. The “Old River Soar” is the non-navigable west arm and is bridged by the Great Central several times. At West Bridge there was a large girder bridge over the River Soar/Grand Union Canal, and two large steel bridges over roads. All signs of these are long gone, except for the blue bricks on the far side of the river, just below the right end of the new apartment block, which were in the base of the bridge abutment. Looking north towards the Central Station. The viaduct immediately south of the River Soar/Grand Union Canal has long been demolished, and here in December 2010 the viaduct further on at Braunstone Gate was being demolished (looking south). The digger is standing on the site of the “Pump & Tap” pub which was demolished the previous year. The magnificent Bowstring bridge in Braunstone Gate before its demolition in 2009 after a prolonged campaign to save it, looking south-east. For more photographs of the bridge and its demolition see the page Old Photographs: Leicester Demolition 2. 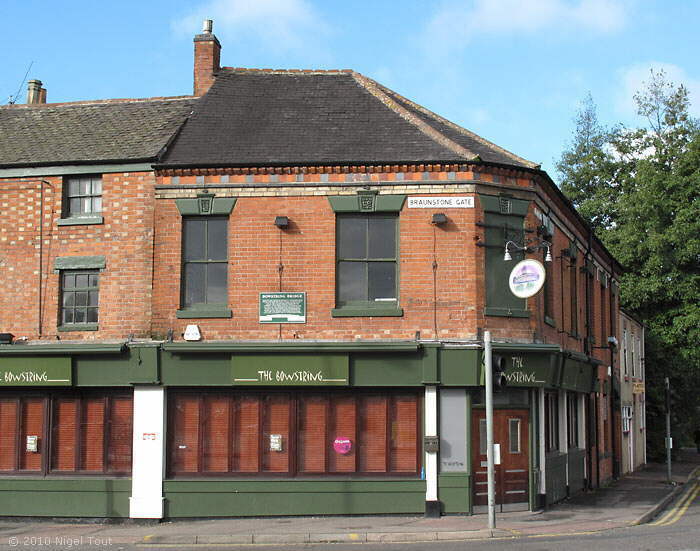 The view in Braunstone Gate in December 2010 after the demolition of the Bowstring Bridge and during the demolition of the north part of the viaduct. 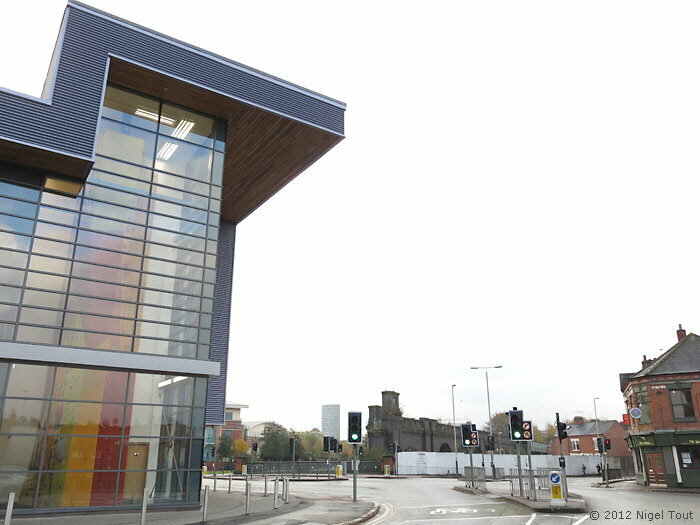 The new swimming pool and sports hall built on the site of the bridge abutment and viaduct on the north side of the Bowstring bridge, looking south. Update March 2013: the Leicester Mercury reported that the city council had sold the remaining viaduct visible in the distance for demolition and redevelopment. In September 2010 a commemorative plaque was put on the wall of The Bowstring restaurant, opposite the site of the bowstring bridge. 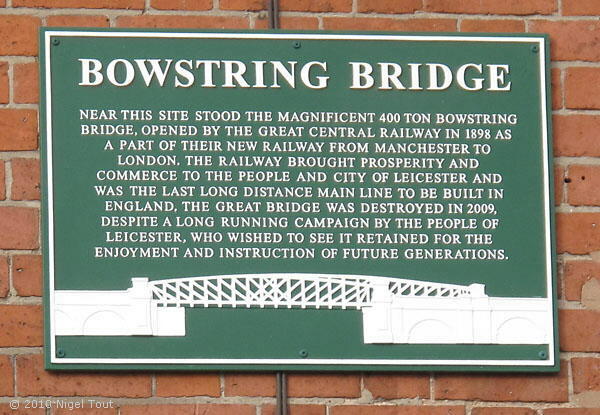 The plaque commemorating the bowstring bridge. The Bowstring bridge spanned both Western Boulevard and the Old River Soar here. The swimming pool and sports hall were built on the site of the bridge abutment and viaduct on the north side. Update March 2013: The viaduct on the left has been sold for demolition and redevelopment. 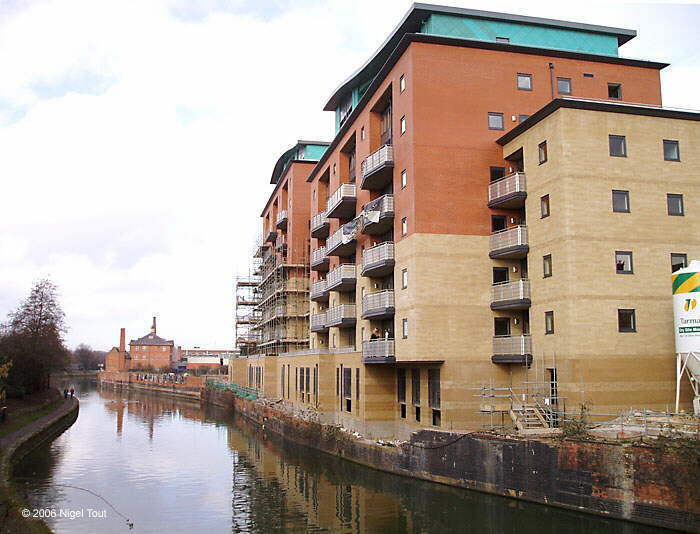 Update March 2019: Plans have been published to demolish the viaduct on the left and build nine storeys of student accommodation which would also straddle the Old River Soar. Another bridge over the Old River Soar 50 yards south of Braunstone Gate bridge, looking south near where the previous photograph was taken. The path on the far left is the Great Central Way which joins the track bed here and follows it all the way to the outskirts of Leicester. At one time the Great Central way footpath crossed this bridge and headed over the Bowstring bridge, which was to the right. The original route of the Great Central Way footpath followed the GCR track bed to the north over the Old River Soar bridge and the Bowstring bridge. The footpath was later closed here and diverted off to the right, though still follows the track bed to the south. Looking northwards through the fence and across the bridge over the Old River Soar. The wooden fence in the distance protects the gap which the Bowstring bridge at Braunstone Gate used to span, while beyond is an apartment block which was built over the route, next to the canal/river Soar shown in the first photograph on this page.